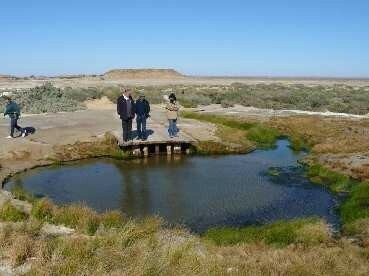 The wide flood-out of the Margaret River near the old railway siding of Curdimurka is the starting point for a story which involves a number of springs near Lake Eyre South, including the principal springs within the Wabma Kadarbu Mound Springs Conservation Park. A Kuyani ancestor Kakakutanha is hunting the ancestral Rainbow Serpent Kanmari and the serpent escapes by disappearing into a spring on the north side of the Margaret. In pursuit of the serpent the ancestor arrives at the Little Bubbler spring Thari-tharinha, believing that the bubbles he can see are from the serpent, which is travelling underground. The serpent is not there, but at the nearby Bubbler Pirdalinha the ancestor comes upon it and kills it with a boomerang, the writhing convulsions of the water being the serpent in its death throes. At Blanche Cup Thirka the ancestor cooks the serpent, the word thirka meaning an oven. The ancestor then throws away the head of the serpent and it becomes Wabma- kardayapu, the snake’s head of Hamilton Hill, the large extinct mound spring near Blanche Cup. At Mt Hamilton Spring Tjarrtha-njudlu south east of Blanche Cup the ancestor eats the serpent, leaving only a rib-bone without any meat for his wife. She subsequently places a curse on him and after journeying back towards Curdimurka via several other springs he eventually arrives at the tea tree-surrounded Kudna-ngampa springs. Near death, his testicles having swollen to an enormous size, he calls all his people to him and then bursts, killing almost all of them and turning them into reeds. Hurled a long way off by the force of the explosion, his testicles become two little islands in Lake Eyre South called Kadlupinpipipalpila. Adapted from Luise Hercus and Peter Sutton, 1985 ‘The Assessment of Aboriginal Cultural Significance of Mound Springs in South Australia’ in Heritage of the Mound Springs, Department of Environment & Planning South Australia, 1986. Arabana people talk with awe of two springs near Mt Margaret, one bright green, the other red like blood. The red spring is associated with a deadly curse that belongs to the Fish and Crane history and nothing will grow around it. Nearby are said to be rocks that look like girls, a locality known as Thita-puntakanha, ‘Bushes Broken’. The crane had become so distracted by his obscenities with his daughters in law that he let go of the bushes with which they were sweeping the water for the two giant Yellow-bellies and the fish escaped. As a result of this a curse is uttered which belongs to the Mangkapilji spring: it makes people swell up and die. Some say that the curse can be turned back by means of the right incantations, but no Arabana person will go anywhere near the Mangkapilji spring. They say the water is undrinkable in any case.